Ever wondered what the point in dog whiskers is? We get to the bottom of the mystery and find out why these strange hairs are necessary. Whether your dog’s is long and coarse or sleek and thin, hair is one of the most recognizable and endearing traits that make them so irresistibly cute. 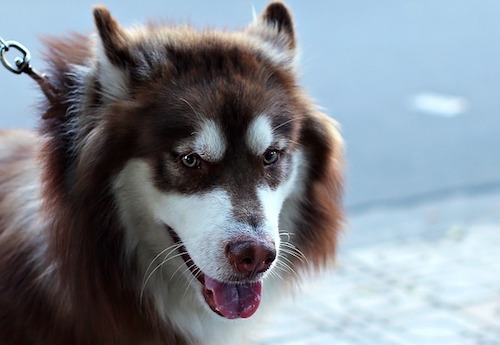 What all dogs regardless of the shape and size of the rest of their hair have in common are special sets of whiskers. These long hairs are found around their eyes and nose as well as on the snout, and are clearly different from their surrounding fur. Why do these peculiar whiskers exist? What is their purpose? Is it a good idea to trim them from time to time? All of these whisker-related questions and many more are answered below. You’ll never look at your dog’s face in the same way again, nor will you think about trimming or cutting them off once you’re up to speed on why dogs need their whiskers and what makes then so special. Vibrissae is the scientific name for the long coarse hairs found on the faces of not just dogs, but cats, mice, otters, seals and a host of other mammals. They’re easily distinguished from other face-covering fur by the fact that they tend to concentrate only in select spaces around the eyes and snout, are much fewer in number, are noticeably longer that surrounding fur and are harder to the touch. The differences aren’t only as skin-deep as that though. If you were to look at a cross section of the vibrissae and their surrounding area, you’d notice that their roots run much deeper than those of regular fur. Three times deeper to be exact, which isn’t surprising given their bigger size. What’s definitely more interesting about them though is that whiskers are innervated, i.e. they’re connected to numerous nerve endings which link them directly to sensory input centers located in the animal’s brain. Why all these special modifications then? 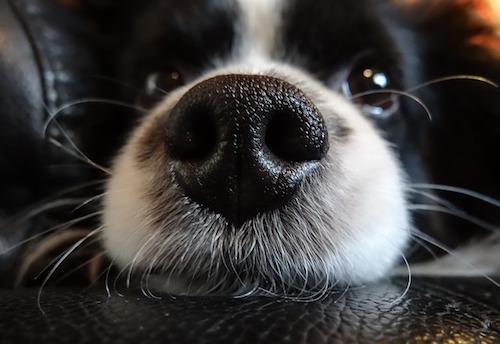 Researchers that have been studying the behavior of mammals in general and dogs in particular suggest that a dog’s whiskers are another kind of sensory organ. They aren’t as vital to their survival as a dog’s keen sense of smell and hearing, but they play an important role in helping them, along with their less refined eyesight, to establish a clearer picture of their surroundings. The whiskers themselves don’t experience any kind of sensory input, but the way in which they move when an object passes by the dog’s face or brushes up against it makes them move inside the follicle in a distinct way which triggers specific nerve impulses that the brain can then interpret as movement, direction, size etc. The tips of the vibrissae are their most sensitive points. They allow the dog to sense disturbances in passing air currents and interpret them. This means that a dog could, for example, sense a tennis ball that zoomed right past its head without making a sound and in the middle of the night. It would get a reasonably clear picture of the shape of the tennis ball as well as its speed and the direction it was headed. Not bad for a set of fancy hairs! The whiskers also help the dog get its bearings in different situations. While swimming, they help establish a dog’s head’s position above water. In cramped spaces, they give the dog an idea of whether or not it can squeeze through etc. They also serve to protect the dog in various ways; when a whisker brushes up against a dangerous surface like a fence, the dog will instinctively back away to avoid getting hurt. Even changes as subtle as a speck of dust landing on the whisker will make the dog blink, ensuring that the dust doesn’t get into its eyes. 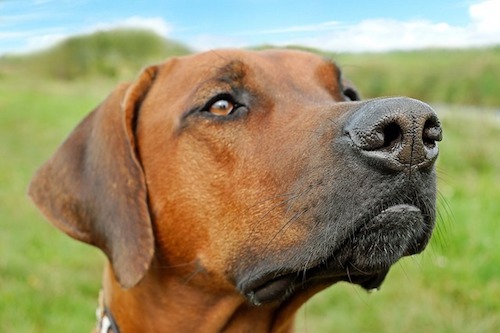 It has been suggested that further back in dogs’ evolutionary histories these whiskers served even more important roles like helping to distinguish food from inedible objects by comparing their texture. 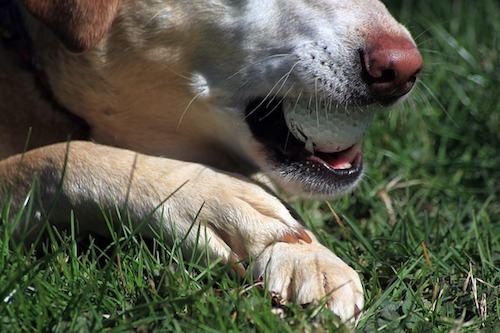 Dogs also use their whiskers when experiencing certain emotions. While there are probably many more subtle uses of whiskers to that effect which we have yet to identify, a clear one happens when the dog feels like something is threatening it. The whiskers of a threatened dog reflexively spring into action, flaring and pointing forward. While this gives off a clear “Do not mess with me!” vibe to other dogs, it is suspected that the whiskers assume this position to better help the dog assess and avoid potential attacks directed at its head. Is trimming your dog’s whiskers a bad idea? If you’re familiar with the dog show scene, you might have noticed that breeders sometimes trim their dogs’ whiskers in order to make them appear more orderly and stylish. While that may bring the dog one step closer to that coveted 1st place ribbon, it definitely deducts points from the owner as it isn’t good for the dog. Remember how acutely the whiskers’ tips can help the dog register changes in its surroundings? With them gone, the whiskers have a greatly diminished range and can pick up much less data for the dog to act on. Some owners have reported that their dogs were genuinely confused after their whiskers had been trimmed and remained that way until their brains had time to adapt. 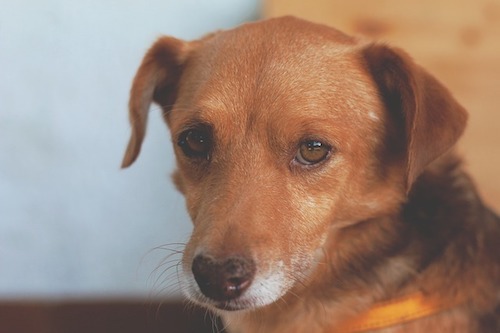 Lucky for both dogs and their owners, whiskers will grow back after a while, but there’s really no sense in tempting fate and potentially harming your pet, so it is highly advisable that you leave its whiskers as they are, no matter how frazzled or unkempt they might appear. It’s fascinating to learn about the ingenious ways dogs and other mammal have evolved to get a more vivid picture of the world which surrounds them. Knowing that something like their whiskers, which look so innocuous but actually have a really meaningful and important purpose, makes you appreciate their uniqueness as a pet even more now. And remember they’re highly important to a dog’s sense of spatial perception and should never be played with or cut. Curious for more interesting animal related articles? You’ll enjoy our post on cat behavior. Ever watched ‘The Office’ and miss Steve Carell? Find out why he left here. Make sure to follow us on Facebook to see more like articles this every day.